Ready for a bit more organizing in 2015? Want to sneak a peak into my drawers? Well today is the day for you. I have been on an organizing kick ever since Donna inspired me to think about heaps of change. I have a few projects in the works, but todays one is all finished and making me so very proud. In my first Heap of Change post I showed you how I created more storage space under the sloped roof of my attic landing. It has been working great. Today we are moving into my craft room itself. My office nook to be precise. In this old image it looks nice and neat. And on a good day it almost looks like this again. 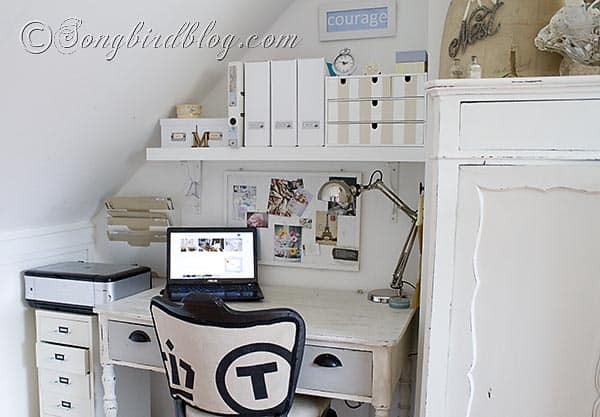 (For a full reveal of my craft room go here). One thing that has changed is that I moved that small drawer cabinet out into the landing into my drawer puzzle there. I replaced it with an Ikea Alex 6 drawer unit. It looks quite nice when it is all closed up. But when you opened it up, it was a mess…. I had just tossed everything and anything into those drawers, and I could never find a thing. But now it is completely organized, looking nice and I can find everything and anything at a moments notice. And it was even fun to do…..
My starting point was this inspiration post by Organizing Queen Extra-ordinaire Jen from I Heart Organizing. 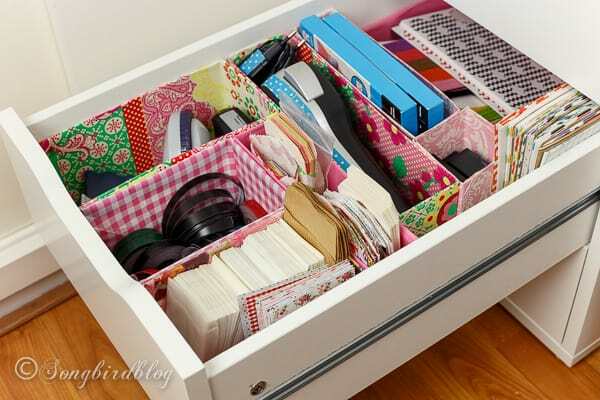 She shows us how to create drawer dividers made from cereal boxes and the likes. I rummaged through my kitchen drawers and gathered up boxes from left and right that might work. I did a dry run until I had a good fit. A silly design error from these Ikea drawers is that they don’t open up fully, so the back is harder to reach. I solved that by using a bigger box in the back (actually the bottom and top of an old IPad box). In days galore I had a thing for pink. So I still had a lot of rolls of pink gift wrap. I used that to cover the boxes. 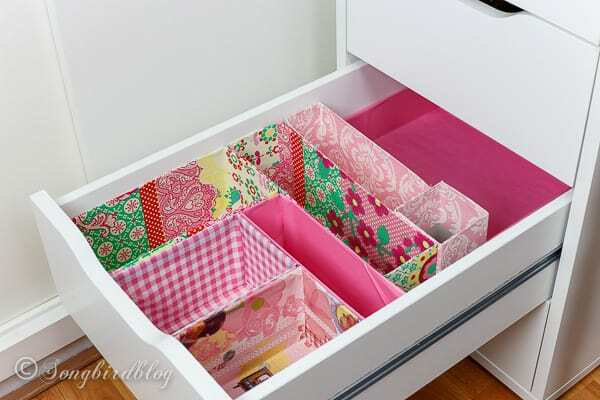 It makes opening up the drawers so fun and cheerful. Makes doing taxes almost fun….. I organized the content by function (more or less). The top one is for my true office supplies. There is a place for everything and everything is in its place…. I love that smaller boxes for paperclips etc cannot topple over because they are snuggled together in their own box. The second drawer is for paper stuff. All my little bags and labels have a place now. As well as both my label makers. I actually had so much space in this drawer that I wen’t through various other cabinets to hunt down little bags and labels to bring them all together. I could never do that before. In the bottom drawer I have a small supply of tools, that come in handy from time to time when working on bigger crafts. So nice not to have to go down from the attic into the cellar to get a screw driver…. You can use Jen’s tutorial to see how to make the paper covered dividers. Go for various sizes boxes, big small, narrow and wide, that way you will have a perfect fit for everything. When cutting the boxes to size think about using them sideways too. And often you can use both ends. Fill up every bit of space. For example I used a lightbulb box to fill up one open spot. It is very small, but turned out the perfect size for my label maker cartridges. When all the empty space is used up, the boxes will have no room to shift and move. You can shorten boxes by cutting them in halves and sliding the halves into each other, that way you can fill up that last empty slot too. Jen suggests using double sided tape to glue the paper down. But I found a glue stick to work much faster and much easier. It also is more forgiving for making adjustments. When cutting your paper, cut it rather a bit too small. That will make fitting it inside so much easier. Don’t fret and don’t be a perfectionist. 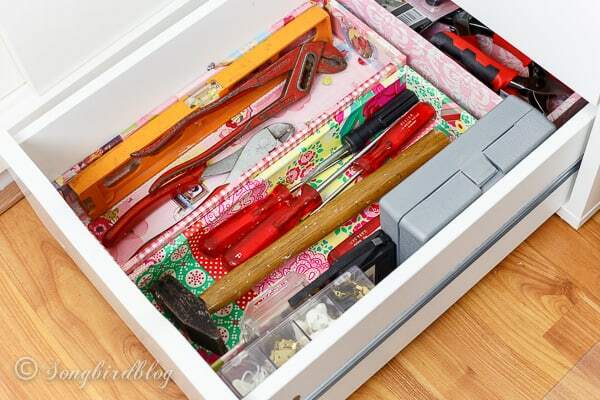 These are inside drawer organizers that will be filled up. Any missed spots or creases are hardly noticeable when the boxes are in use. Ah, I love a good bit of organization. 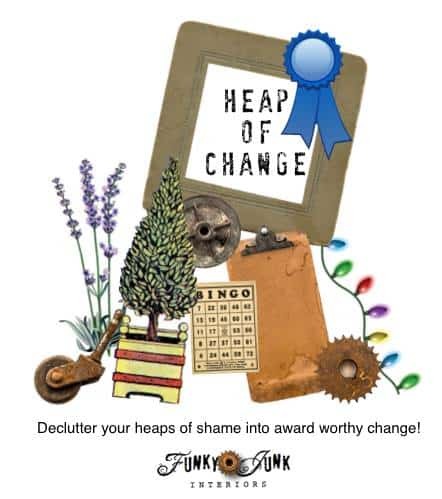 Ready for more inspiration than check out the work of my other Heap of Change Coaches. Your storage is so colorful and works so well. There’s no question about where things should go. Good for you! I’ll be posting my Cheap of Change Challenge later this evening. SOOOO gorgeous! I am HUGELY inspired! I do believe cereal boxes may be in our future on this one… genius! This looks great! I’ve pinned this for when I finally get to my desk! I love how your drawer re-organization turned out. Such fun and inspiring colors! 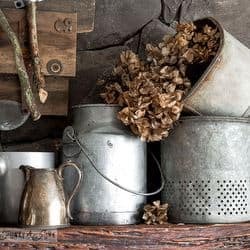 I have been looking to corral my craft supplies since I’ve crossed over to the colourful, diy side but could not for the life of me figure out how to use what I have to do so. I have a spare dresser near the area I want to use as my craft station that only has 2/6 drawers being used (for tools). Just the thought of turning those other 4 drawers into craft storage for FREE (my favourite word) is making me giddy with excitement! Thanks for sharing this!